Last time I wrote about the problems I was having with a meteor detection system that relies on National Weather Service weather radio stations. The problems were so substantial that I indicated I'd be looking into using Canadian TV station signals as the basis for meteor detection. I've now done that in at least a preliminary way, and the outlook is much more promising. Good introductions into this method are found here and here. In brief, there are a handful of Canadian TV stations that continue to broadcast powerful analog video carriers at frequencies that are near optimal for meteor detection. Because these stations are located near the U.S.-Canada border, it's possible for most of the eastern and midwestern U.S. to use them for meteors. The antenna. Not only must it be designed for the lower frequencies, but because you will be listening to a specific station you can use a directional antenna. One catch, though: With the switch to digital TV, lowband VHF antennas are becoming more difficult to find. The nice thing about these is that they're all far enough away that aircraft arriving at and departing from the nearby airport can't cause enhanced reflections. At the same time all of them (except Channel 2 in Sault Ste. Marie) are far enough away that aircraft flying at flight level 410 also can't cause spurious reflections. My antenna is an old FM/TV multi-element antenna hanging in the attic of a wood frame house. It's directed about 40 degrees east of north. 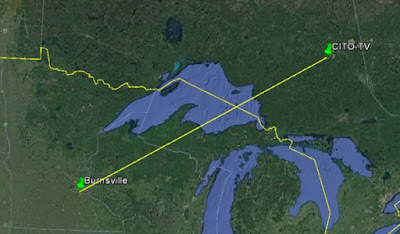 I'm initially monitoring the same station in Timmins, Ontario, used by MeteorsLive.com , which is about 61 degrees east of north. The misalignment probably isn't significant given the antenna design. I've surveyed the available channels, and only 4 and 6 did not show evidence of any meteor-like signals. Channel 4 in Sydney, Nova Scotia, is beyond the 1400 mile limit and can't provide single-reflection meteors. Channel 6 in Medicine Hat, Alberta lies at a right angle to the axis of my antenna. I'm happy to say that Channel 3 at 61.26MHz is producing a substantial number of strong pulses that resemble those suggested to be reflections from meteors. It actually seems to be working, and working well. The question now is: Are the meteor-like signal pulses really of meteoric origin, or is some other process at work? The only way I know to answer this is statistically. Will meteor counts match the known diurnal variation? Will meteor counts become enhanced around the times of notable showers? At this moment I'm running the system, doing screen caps of SDR#'s waterfall display at regular intervals. I'm going to run it for 24 hours and analyze the data to compare frequency and time of day. I'll probably have the results later this week. I'll do the same at the time of the Perseid shower in mid August.